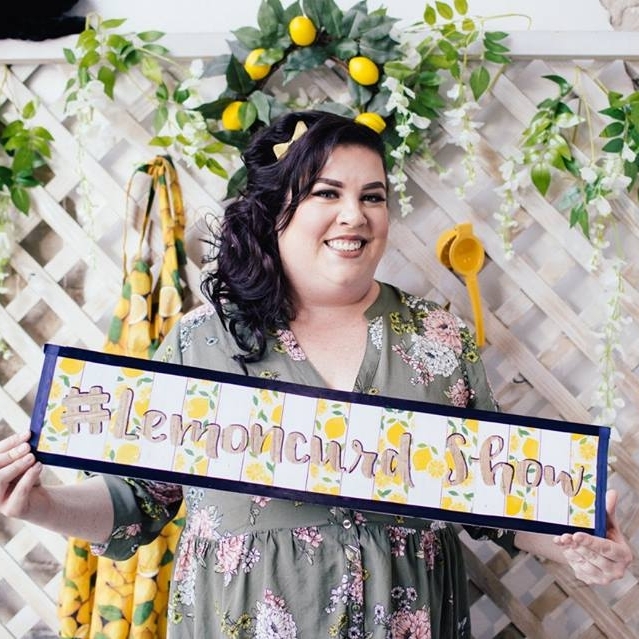 By day, Laura is a Teller for J.P Morgan Chase, but the heart of her work lies in Lemoncurd — a comedy web series she wrote and starred in about a bored, Southern housewife trying to create her own cooking show. From script-writing (and memorizing!) to acting, filming, producing, editing and every odd responsibility in-between, none of the Lemoncurd magic is made until after Laura and her team — like so many of us — clock out of their 9-5 jobs. Her commitment to her passions and fervent support of other fellow creators gives us so much hope for hustlin’ babes everywhere who are fighting to achieve their dreams against all odds. My late grandmother. I lost her last year and I miss her every day. She always put our family first and she loved us fiercely and unconditionally. I never saw her do a selfish thing. Until she got sick, she was my biggest fan. She attended every single dance recital, play and concert I was ever in. She made me feel smart and talented and loved. She was a great lady. I really wish I could share my current artistic endeavors with her; I know she’d love it. I love TV, so there’s nothing I love more than a good than a good television binge. I’m constantly programming dates of various premieres into my phone so I don’t miss them. I even throw themed watch parties for certain shows, complete with themed meals. Leslie Knope. She’s driven, loving, goofy and principled to a fault. She cares so deeply about everyone in her life and is constantly pushing them to reach their full potential. Even Jerry. She and I both firmly believe we can make our hometowns a better place. “Don’t Stop Me Now,” by Queen. I’ve had a lot of experience writing and directing children’s theater, but I’d love to direct something for adults. I’ve been asked a few times over the years, but I’ve been too intimidated to do it. Tina Fey. I don’t normally get weak in the knees at the thought of encountering celebrity, but I’d probably faint if I got to spend one-on-one time with her. Everything she’s accomplished in her career is something I’d kill to be a part of. I’m also convinced she’s the funniest person on the planet. Because I work in a branch, my day to day at Chase is almost all customer service-based. When you're working in an industry that deals with people's hard-earned money, you encounter a LOT of high stress situations and emotional interactions. People experience fraud, identity theft, stolen or lost wallets, and they come to me for help. I see a lot of people who are having a really bad day because of these situations. When people walk through the door, my job is to handle whatever situation they present to me as seamlessly as possible. It can be difficult because you have to establish immediate trust, you need to show them that you're really listening and you're on their side. Being able to provide that experience to customers requires a lot of knowledge so continued education in this field is important. It sounds cliche to say that you learn something new every day but you really do. I’m also the creator of a comedy web series called Lemoncurd. It’s the story of a bored, Southern housewife named Virginia who’s trying to create her own cooking show. I write and star in the show and I also serve as one of the producers. I work a nine-to-five, so when I get off work at my corporate job, the creative hat I have to wear depends on the timing. In-between production weeks I’ll typically spend my time after work in a restaurant booth writing and editing scripts. The weeks leading up to a shoot are filled with coordinating schedules, memorizing lines, attending production meetings and rehearsing. So far, there’s no routine. It’s been a completely different experience from episode to episode. We’re creating something completely new in our city, so we have no model to base everything on. We’re all just motivated people who care, and we’re giving it our best shot. I love cooking shows. They make life look so breezy and idyllic. Nothing bad ever happens in the world of a cooking show. I’m sure there are many people who watch those shows and think: That’s easy! I can do that! I wanted to create a series that explores what happens when someone who has zero experience in television production tries their hand at it. The character of Virginia is sort of a mashup of my late grandmother and all those smiley cooking show hosts. I got the name from a former coworker who once told me that she loved something called lemon curd. I didn’t know what it was, so the name invoked an image of lemon-flavored cottage cheese. Some months later I saw a jar of it at a Trader Joe’s and bought it. It turned out to be a delightful dessert topping! It was something I had the perception of being gross—but wasn’t. The name just stuck with me. The show has had quite a long evolution, but I truly owe its very existence to my friend and fellow producer, Abigail Saenz. We were living together when she encouraged me to write the pilot script based on a goofy Snapchat series of a videos I’d made while cooking dinner. When I finished the script, she started pitching it. After a couple false starts and over the course of four years, she finally connected me with local filmmaker Drew L. Brown, who ended up taking on the project. He was worth waiting for. With every new episode, we explore ways we can expand the show and push ourselves. Right now, we’re using crowdfunding to fund this project. My immediate vision is that we’re able to secure a future where we don’t have to do that. Everyone working on this project is so talented and passionate, and we just want to continue to make this show. Have you always had a passion for theater? I grew up dancing competitively and I absolutely loved it. I got completely addicted to performing in my formative years, and I looked for any outlet to be onstage. I danced, I joined drama club, I sang in choir, I played instruments, I just wanted any excuse to be a part of a group of people creating art. I was kind of an obnoxious kid with too much energy, so comedy was definitely an outlet. Other kids thought I was funny, so I definitely started to play up that side of my personality. I think everyone worth their salt in the comedy arena goes through a Saturday Night Live phase. I hit mine around sixth grade and just worshipped the show. I would tape it every weekend and study it like it was my job. It was required viewing at sleepovers. I started coming up with parody sketches for group projects for school. I once did a parody of “Delicious Dish” as part of a science class presentation, and the teacher liked it so much she made us stay behind to perform it for her next period class. That’s around the time I started getting feedback from adults that I might actually be funny. I tended to take on natural leadership roles in my dance and drama classes. People, for whatever reason, listened to my ideas. It slowly evolved into writing, but it became a more major creative endeavor for me when I started writing full-length children’s shows for the local theater where I worked. I sat in the audience for the very first show I’d written and was expecting these kids’ parents to get none of my weird jokes. They laughed loudly and heartily at almost every one and were so kind and generous with their compliments after. That’s when I thought: Huh. Maybe I can actually do this. ﻿How do you balance your career in entertainment with working full-time at Chase? I’m able to find balance because I found the perfect people to work with. My co-producers Drew and Abigail are my dream team, and we all have the same vision. We communicate with each other openly, honestly and with kindness. I would advise everyone in any creative endeavors to wait for your people. They are out there; you just have to find them. These relationships are so important and they can be really intense, so you have to partner with people with whom you feel that strong connection. Find people who “get” you. Constantly. I remedy creative burnouts by turning to the great art that inspired me in the first place—I watch great comedy! It never fails to inspire me. I have worked either in customer service jobs or with children ever since I started working. Your bad day and your personal life have no place in either setting. It’s great practice for learning how to focus and wipe your feet at the door. In school, I majored in acting and I used to have the worst time trying to find audition material, so that definitely inspired me to create my own content. As helpful as that has all been, I do not know how to market myself. I lean heavily on other people to do it for me, and I’ve got to get better at it. We just completed the sixth and final episode of the first season of Lemoncurd. We shot a full-length episode during two overnight shoots in one weekend, with a cast and crew of nearly 40 people. When we finally wrapped, it was 6:00 a.m. after our second 15-hour day, and I just sobbed. I couldn’t believe we’d pulled off a whole season of a TV show, and that everyone had given so selflessly of their time and talent to get us there. I’ll never forget that moment. There is still this infuriating “women aren’t funny” undercurrent running through our society, and it drives me bonkers. There’s also this weird experience I keep having where, if a man finds out that others find me funny in a social situation, they feel the need to either match me or try to best me. Nine times out of 10, they aren’t funny at all—but if I don’t laugh, they act like I’m being rude. I think men are just so conditioned to have women giggle at them that they get upset when they encounter someone who prefers not to pretend. Things like that carry over into work environments and I’m reaaaaaally tired of laughing at lame dad jokes just to try and save some dude’s fragile feelings. Guys, the ladies can be “the funny one” at work or at a dinner party. It’s cool. Gender ratio in the film industry? That’s almost a joke in itself, isn’t it? And that’s sad, because I know so many women who are perfectly capable of taking on roles in film that aren’t just “actress,” but I think they don’t pursue it because it’s still such a boy’s club and they don’t know how to break into it because they aren’t offered the opportunity. I’m coming from a limited perspective given that the film industry in my city is quite small, but I’ve encountered very few women so far. I think we’re doing a great job on our set of lifting up women in our community and offering them new roles to step into, both on and off camera. I had never acted on camera before Lemoncurd, and it was so nerve-wracking on our first day. It’s completely different from stage acting, because you have to adjust so much about your voice and your mannerisms. I think I was driving our director nuts with questions about my performance (although he didn’t show it). He was totally patient with me, and the only reason I don’t look completely crazy in our first episode is because he’s terrific at his job. Don’t be afraid to create your own material if you can’t find it. The stories women have told throughout history are vastly outnumbered by those men have told. This 10,000 percent translates to film and stage. If you don’t like all the parts men have written for you because you don’t fit the exact mold of the ingenue, or the manic pixie dream girl, or the old crone or the distant ex-wife—then write your own! Use your voice! Be authentic. Don’t giggle if it isn’t funny, don’t say you’re sorry if you aren’t, and don’t say it’s OK if it isn’t.